Here was an interesting shot (above). I wanted to create some movement, so I had them dance in place. I had a very powerful remote studio light that my assistant is holding onto, camera left hidden behind the pillar so that I could control the sky and background. I shot this from a very far distance at 200mm almost standing in the main lobby looking back (which is a few hundred feet away). I needed to do this, so that I could “compress” the archway to fit into the viewfinder, as I did not want to shoot with a wide lens, because it would have made them look too “small” in the frame. 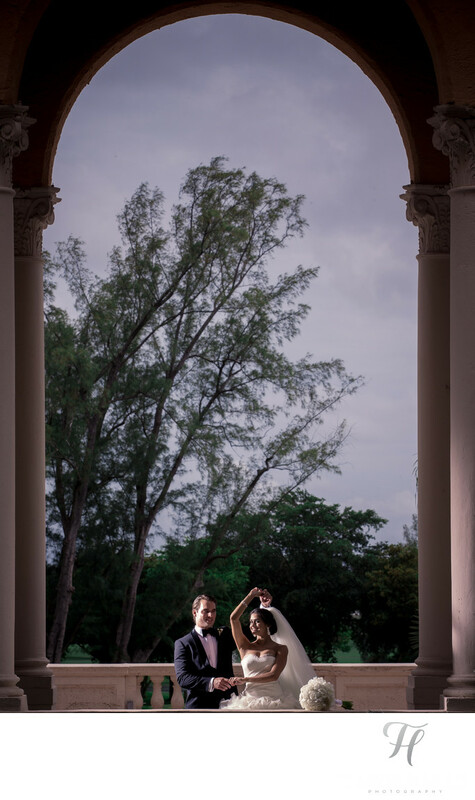 So using the compression from the lens, and some powerful off camera lighting, I was able to create a very, very impressive and very unique shot for this Wedding at Biltmore Miami. I really think the challenge that most photographers face, is how can they go to the same place over, and over again and still truly make unique content for their clients? I am no different, and I too am faced with this all the time. But, I use my skills to my advantage and I don't "hide" behind any specific "style" in doing so. I take pride in trying to push the limits, and find new and innovative ways to make results that are worth showcasing.